Maintaining the breeding value of older mares and stallions had been a challenge, but that challenge might have met its match with the advent of Intra-cytoplasmic sperm injection (ICSI), a procedure used with the world’s leading performance horse stallion, High Brow Cat. Already in use among humans for more than 20 years to address male infertility, ICSI is, in simple terms, the method of selecting a single sperm to be injected directly into an egg. The process in horses, however, is still relatively new, leaving mare owners with questions about how it works and its safety; questions that High Brow Cat owner Darren Blanton understands. Blanton points out that ICSI actually introduces a positive aspect to breeding that allows mare owners the opportunity to breed earlier, with the resulting foal being a more structurally and mentally mature animal at the beginning of training and later in competition. Furthermore, among many other benefits to breeding with ICSI first, mares do not have to be in heat or placed under artificial lighting for the procedure to work, which allows them to come in naturally on their own in the spring. Other benefits, Blanton said, include that immature aspirations require no hormones to be given to your mare and there is no exercise restriction with oocyte harvests so it won’t interfere with training programs or show schedules. Typically after breeding a mare to flush an embryo, only “light-moderate exercise” is recommended until the embryo is flushed out. And, finally, mares can be hauled in or checked at home leading up to the aspiration and the aspiration itself can be done as an out patient procedure- no spending the night to check for ovulation or fluid the way a standard insemination would need to be. After aspiration, or the collection of an oocyte (horse egg) from a follicle on the mare’s ovary, a microscope with micromanipulators is used to mechanically inject one sperm cell into the egg. After 8 days in the incubator, the embryo is transferred into the uterus of a recipient mare (surrogate mother) that will give birth 11 months later. 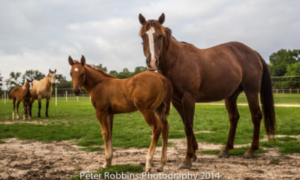 The application of this cutting edge technology has produced foals from outstanding genetic individuals that otherwise would have been lost to the gene pool. Texas A&M and Colorado State University are the primary centers of research in equine reproduction. Due to the investment in laboratory facilities, equipment and supplies, which can easily reach several hundred thousand dollars, in addition to the learning curve of several years, there are only a couple of private veterinary hospitals offering these services. Dr. Rob Foss at Equine Medical Center in Columbia, Missouri and Dr. Rick Beck at IN Foal, Inc. in Hemet, California are the two hospitals that have produced several live foals by this procedure. To learn more about the ICSI process and watch videos, or more about High Brow Cat, visit his website at highbrowcat.com or contact breeding manager Christina Kirby at 940.748.2610.